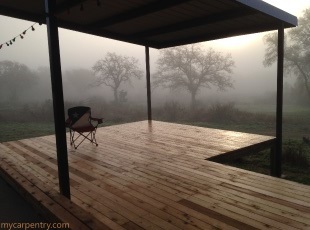 This particular cedar deck project was special to me; I have built hundreds of decks over the years, but this was the first deck I ever designed and built for myself. 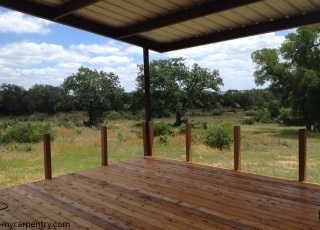 I was anxious to get started - I could already imagine relaxing on my new deck on a warm summer day, with a cold beer, looking over the lake and hills beyond. 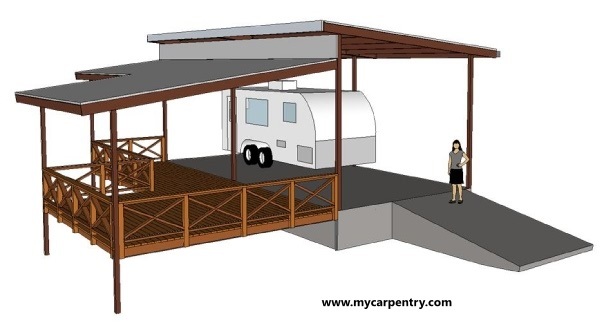 I used Sketchup Pro to design the existing structure (known as the RV-pad) and the cedar deck. 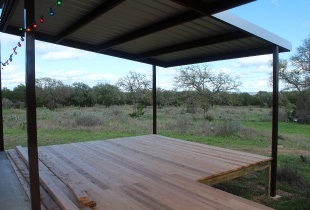 The concrete slab and metal structure had already been built, by a local steel contractor, near the high back corner of our 5 acre hill country ranchito. 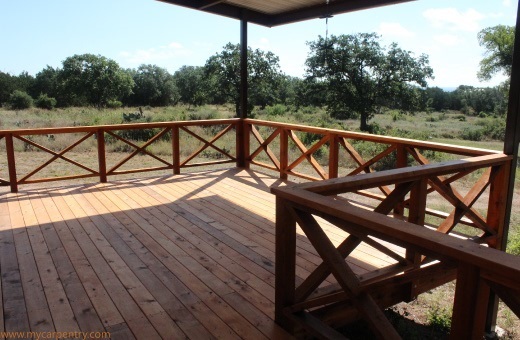 It is nested between two clumps of live oak trees, and overlooks the entrance to our property and the lake in the distance. 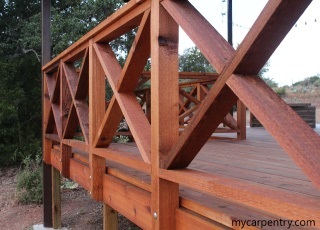 I used pressure-treated pine to build the frame of the deck (support posts, beams and joists), and western red cedar for the decking and railing - essentially, all exposed wood was western red cedar and the underlying structure was pressure-treated pine. Since the dimensions of this cedar deck were already pre-defined by the existing building, all I needed to do was design a structurally sound deck that would fit between the concrete slab and the support poles of the metal roof. 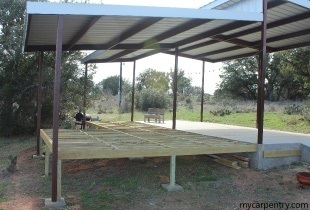 I wanted the finished deck surface to be the same level as the top of the concrete slab, so there would be no steps or transitions to trip over. 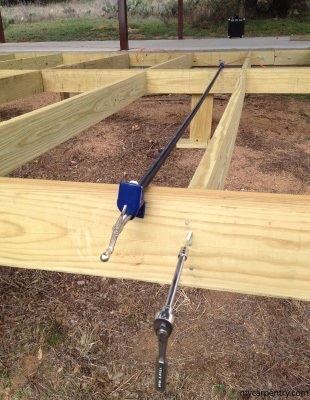 I also wanted the deck rail posts to align with the existing support poles. I drew a detailed framing plan so I could accurately estimate the materials (wood, nails, screws, etc.) I needed. 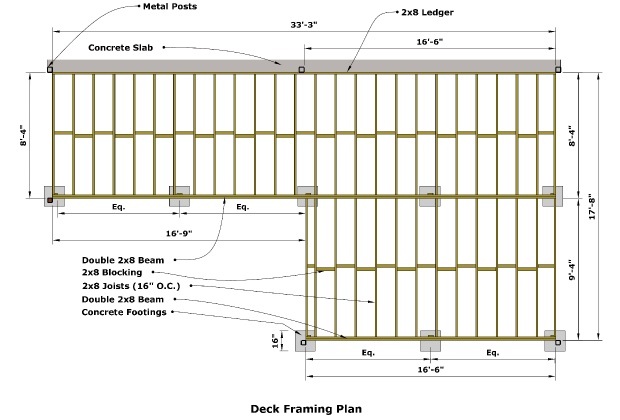 High-Level Deck Framing Plan: Assemble the perimeter deck frame first, temporarily supported by 2x8s used as posts. 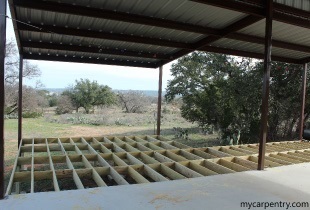 Create the center and front double 2x8 beams by adding 2x8s to the existing perimeter frame. Install 2x8 joists. Level the entire deck frame. Dig footings for the permanent support posts. 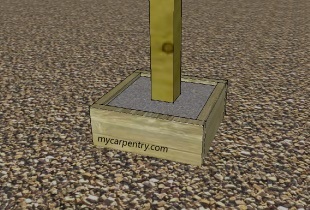 Build square concrete forms using scrap 2x8 material and position them under the locations of the permanent posts. Add the permanent 4x4 posts. Check the frame again for level. Fill the forms with concrete. Allow the concrete to harden. Remove the temporary supports and forms. Use the scrap 2x8 material for blocking between the joists. For placement of the ledger board, I measured down, from the top of the slab, 1 1/2" (the thickness of a 2x6 cedar deck board), and made a crows-foot style mark on the front of the slab (at each end) with my carpenter's pencil. Using a chalk-line tool, I stretched the line extra tight between the two marks and popped a 33' blue chalk line onto the slab. It is a rare privilege to work with a slab that is perfectly level and straight. Mine was certainly not - I had to make adjustments to the height of the frame to compensate for a 1/2" dip in the middle of the slab. 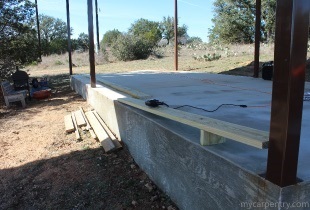 With chalk line popped (and adjusted for the 1/2" dip), the next step was to attach a 33' long 2x8 pressure-treated ledger board to the front-side of the concrete slab. I used three 12' 2x8s for this. I cut them so that, when placed end-to-end, they added up to the 33' ledger that I needed. Before I attached the 2x8 ledger boards to the slab, I placed them end-to-end and (using a tape measure, speed-square, and pencil) laid them out (16" O.C.) for the 2x8 floor joists that would be attached to this 33' ledger board once it is in place. With the locations of the joists determined, I also marked the locations of the holes needed for the concrete anchors (6" from the end of each ledger-board section, and approximately 24" apart). Next, I used a 5/8" wood paddle-bit to drill holes, through the 2x8s, for the 5/8" x 6" concrete anchor bolts that were used to secure the ledger boards to the slab. 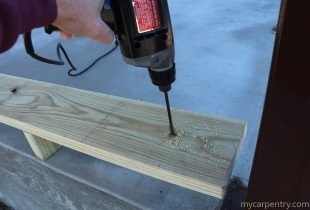 This was needed before attaching the 2x8s to the slab because you can't drill wood with a concrete bit and you can't drill concrete with a wood bit. Once the holes were drilled in the ledger-boards, I positioned the first one onto the front of the slab, aligned it side to side, held it up to the blue chalk line, and secured it in place using a Ramset and 3" nails. 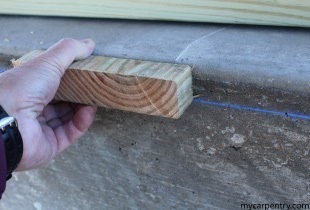 Once the three ledger-boards were held in place with the Ramset nails, I used a Hammer Drill with a 5/8" concrete bit to drill 6 1/2" deep holes into the concrete, through each of the pre-drilled holes in the 2x8 ledger board. I wrapped a piece of tape (to use as a guide) around the drill bit 6 1/2" from the end to ensure that my holes were deep enough for the 5/8" x 6" concrete anchor bolts. It is better to make the holes too deep than not deep enough. 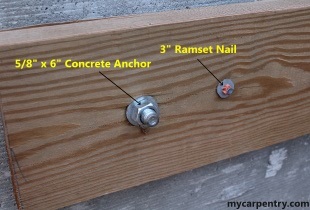 Using a Ramset with 3" nails is perfect for holding the ledger-board in place until the concrete anchor-bolts can be added. After drilling the first concrete hole, I threaded a washer and nut onto the anchor-bolt (1/4" past the tip), and drove the anchor-bolt, with a hammer, through the ledger-board and concrete, as far as it would go. I used a crescent wrench to tighten the anchor-bolt nut until the anchor was seated and snug. I repeated the above steps for each of the remaining concrete anchors. It is important to thread the washer and nut onto the concrete anchors before driving them into the holes with a hammer. 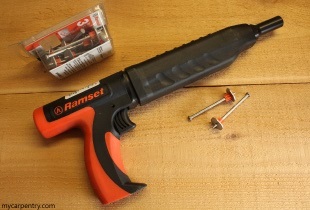 The hammer can damage the threads, making it difficult to thread the nut later. 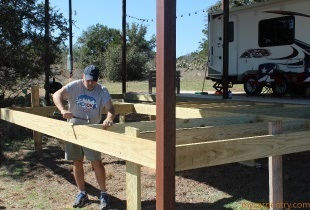 Using the straightest pieces of 2x8 lumber, I built the perimeter of the deck frame first, so all of the outer dimensions of the deck frame were defined, before adding the internal structure of beams and joists. All framing materials, unless otherwise noted, were fastened together with 16d galvanized spiral-shanked nails. 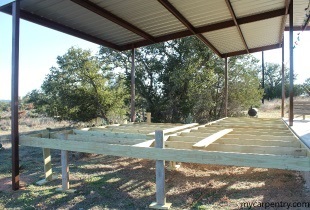 I used my 4' level to level each section before supporting it with temporary 2x8 posts. I nailed the temporary supports a few feet from where the permanent support posts would be located so that they wouldn't get in the way later. The metal framing of the existing structure was just about perfectly square, making it easy to build around. The concrete slab wasn't so perfect - it gradually bowed outwards about 1/2 inch towards the middle. When I began adding the joists, I measured and cut each one separately, so that they wouldn't gradually push out the outer deck frame. 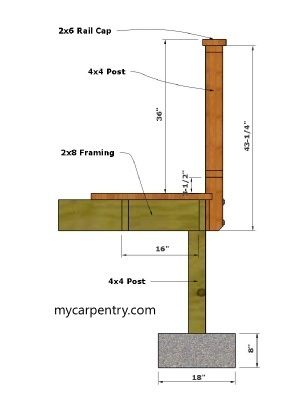 As shown in the deck framing plan, I built a 33' double-2x8 beam, supported by five 4x4 piers, in the center of the deck frame so that all of the 2x8 joists would be less than 10' in length. There are several reasons for doing this. Lumber is generally cheaper per foot, if you can make use of shorter lengths. Shorter lengths are also easier to handle than the longer lengths and can be hauled in the back of a pickup truck, rather than having to buy or rent a trailer, or worse, having the lumber delivered, and selected by someone you don't know. Another reason for the using shorter lengths, and perhaps the most important, is design-load. The weight a 10' 2x8 can carry, is much greater per foot than a 20' 2x8. 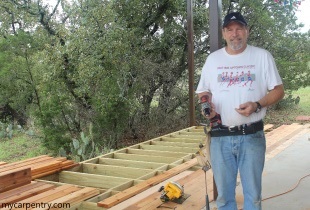 Without the double-2x8 beam to break up the joist span, I would have to use 2x10s for joists and space them 12" O.C. in order to span the required 17' 8". 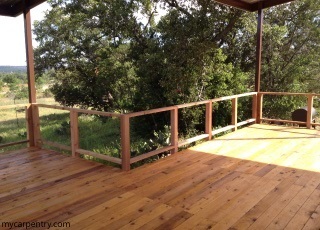 For this cedar deck project, I only bought the amount of lumber I had time to nail-up in a two-day weekend. 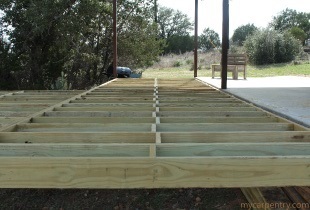 I nailed joists between every other layout mark to hold the deck frame together, and to keep the beams from bowing, until the next weekend trip when I could return with the rest of the joists and complete the framing phase. I returned a couple of weeks later to discover my outer beam had bowed slightly outward. I could see there was a gap between the joists and the outer beam that didn't previously exist. I used a 10' pipe-clamp to pull the outer beam in towards the inner beam to tighten the gap between the joists and the outer beam, and used 1/4" x 6" lag screws to keep the beam from pulling away from the joists again. 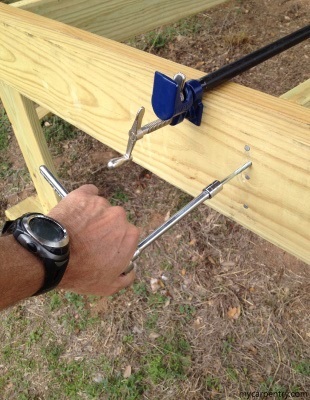 A pipe-clamp is a handy tool to have around when building decks. If I had needed a clamp that was longer than 10', I could have added length to it by using a coupling. 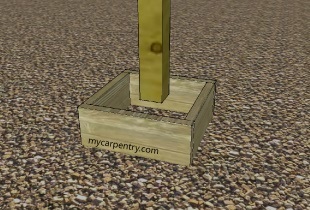 I constructed wooden forms for the concrete footings out of scrap 2x8 material. The inner dimensions of the forms for this deck's footings were 8" deep, 18" long, and 18" wide. Before putting the forms in place, I dug down to undisturbed earth (which in my case, was only a few inches). The soil consisted of packed crushed granite mixed with various size granite rocks. 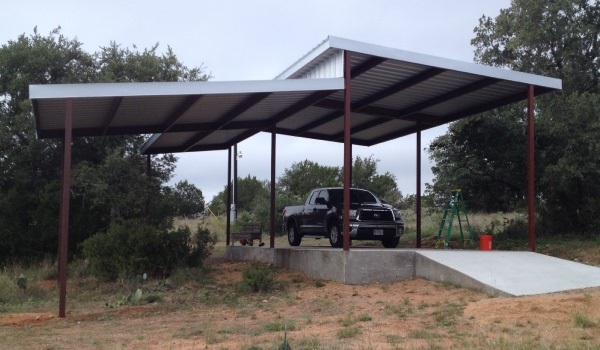 In Central Texas, I was able to place my concrete footings just below the surface of the ground, but soil conditions vary considerably in different parts of the country and the world. You will need to consult your local building authorities to determine the code requirements for the sizes and depths of deck footings in your area. 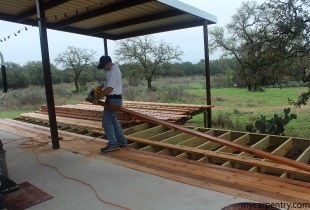 Once the wooden forms were in place, I measured down from the bottom of the deck to the top of each form and cut the permanent vertical 4x4 posts about 1/2" longer, so that when attached, they would stick down past the top of each form. I cut each post to length and attached them to the bottom of the deck with a combination of 16d galvanized spiral-shank nails and galvanized straps. Since I didn't need much concrete for this deck project, I mixed the concrete in 5-gallon plastic buckets. I filled the forms with concrete up to the bottom of the 4x4 posts. The next weekend, after the concrete had cured, I removed the forms. I added the remaining 2x8 joists and used scrap pieces of 2x8 as blocking to keep the joists from bowing. This wasn't a requirement, but it stiffened up the deck frame nicely and was a much better use of the material than sending it to a landfill. I popped a chalk-line down the center of each section of joists and staggered the joist-blocking so that they could be nailed straight-in from the other side of the joist, rather than toe-nailed. 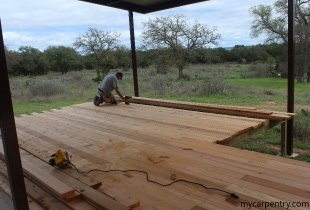 I used a combination of 18' and 20' western red cedar 2x6s for the decking. The longest width of the deck was 33'. 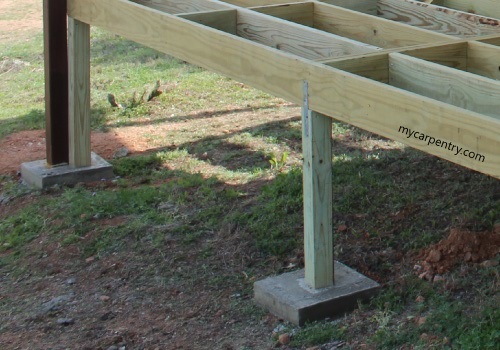 I could have used a combination of 16' and 18' 2x6s to complete the span, but it is good practice (and looks better) to stagger the breaks in the cedar decking at least two joists apart. 16' and 18' lengths could only be staggered 1 joist apart. 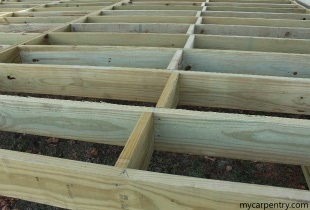 I used my Framing Plan to estimate the quantity of 18' and 20' deck boards to purchase. I added a few extra 18 footers for the handrail and another 10% (for waste), because I was having the lumber delivered. I figured that there would be a few ugly ones that I wouldn't want to use on the deck, but could use the good parts of them to build custom benches and such. The cedar decking arrived on a Saturday morning soaking wet, in fact, it was raining while I helped the driver unload the lumber onto the outer deck frame. I separated and stacked the boards by size and pulled out a few of the best looking ones for the handrail. Most of the lumber was straight and only a few of the planks had large knots. To ensure the first few rows of decking were perfect, I started with 10 of the straightest boards I could find. With my circular saw, I squared off the inside end of the planks and let the other end run past the edge of the deck (to be cut later). 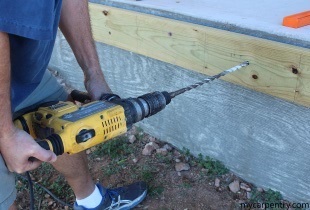 I purchased 3" Star flat-headed deck screws to fasten the 2x6 cedar planks to the pressure-treated joists. The box of screws came with a new Star-drive that I used with my Milwaukee cordless drill to install the cedar decking. The cordless drill and Star-drive combo worked perfectly. I was surprised the Star-drive lasted the duration of the project. Each new box of screws came with a new Star-drive - needless to say, I have plenty of spares. 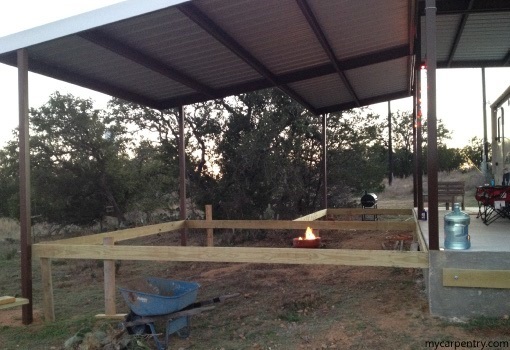 Once a few rows of decking were screwed down, I randomly mixed in a few of the planks that were a little crooked. I used a hammer and wood chisel to pry the crooked deck boards in place, and while holding the board in place with the chisel in my left hand, I screwed the plank down with the cordless drill in my right hand. 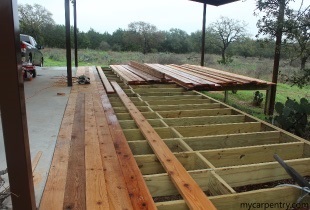 When laying cedar decking, it is a good idea to mix the crooked boards in with the straight ones. You don't want to have nothing but crooked boards to deal with when you get down to the last few pieces of decking. Once all of the decking was down, I trimmed the overhanging planks so that they overlapped the deck frame by 1 1/2" - I marked both ends of each section with a pencil and popped a chalk-line between the two marks to use as a guide for my circular saw. 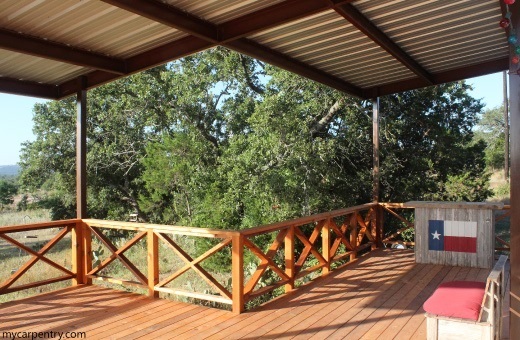 There are many deck rail designs. Each of them have their advantages and disadvantages. 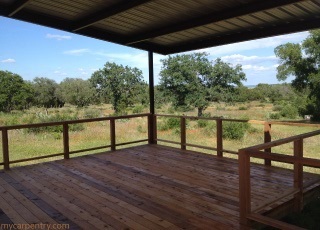 For this deck, we chose a ranch-style crisscross design. This style is easy to build, but as it is, will not pass building code. 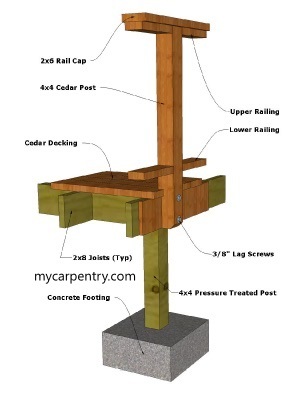 The deck railing page on mycarpentry.com is a good example of a code-compliant design. The code (CABO 1986 Edition) states that an object 6" or greater in diameter should not be able to pass through any part of the railing. It also states that railing is not required if the deck height is less than 30" above grade, but if railing is required, it must be at least 36" above the surface of the deck. Many sections of my cedar deck did not require railing for safety, but I wanted it to have something to lean on, and plenty of places to park my beer when I'm not drinking it. When I laid out my deck for rail post placement, I calculated each span separately. Since the spans between roof support poles vary in length, the distances between the individual rail posts will also vary. The span on the front section is 14" less than the span on the neighboring side. As long as the space between posts, in any one span, is the same, it will look pleasing to the eye. Since the cedar decking overhung the deck frame 1.5 inches on every side, I needed to notch out the decking at the location of each 4x4 post. I used a jigsaw and wood chisel make the notches. I cut the 4x4 cedar rail posts to length (43 1/4"), so when attached to the deck frame, the top of the post would be 34 1/2" above the surface of the cedar deck, and the bottom of the post would be flush with the bottom of the deck frame. I cut a 45 degree notch at the bottom of each post for looks, but it is not required. I toe-nailed the rail posts in place with 8d nails and checked them for plumb. 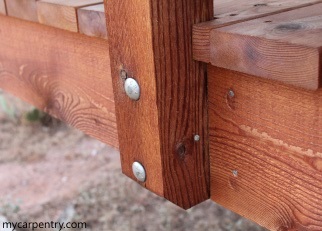 I drilled two 1/2" diameter holes through the 4x4 cedar posts and pressure treated framing, and bolted them together with 3/8" galvanized carriage bolts. After completing the installation of the crisscross style railing, I trimmed the outside of the 2x8 pressure-treated framing with 1x8 cedar, thus covering up the remaining visible pressure-treated framing material. I cut the 2x6 rail cap sections to length, from the lumber I previously set aside for this purpose, and fastened them to the 4x4 rail posts using the same 3" wood decking screws. Once the complete deck was built, I sealed all of the cedar surfaces with PENOFIN Penetrating Oil Finish - Western Red Cedar. I found the coverage to be greater than indicated on the gallon-sized can, and ended up taking an extra gallon back to the hardware store. A month later, I went back and purchased another gallon (probably the same one I returned) to finish the job. I have worked with western red cedar for years and find it to be an excellent choice for deck and patio cover material, but you have to keep it sealed. It has been about 6 months since I sealed this deck; it has faded slightly, but is still well preserved. I plan to seal it again in a couple of months and I am certain it will bounce back to its first-year luster. I expect the second sealing to last at least two years and the third sealing to last at least five years. 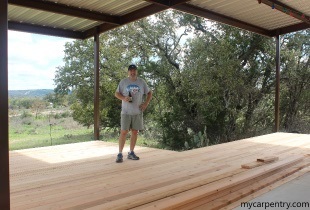 It has been almost a year since I began building the cedar deck project. It took about 5 months of random weekends to get the job done. 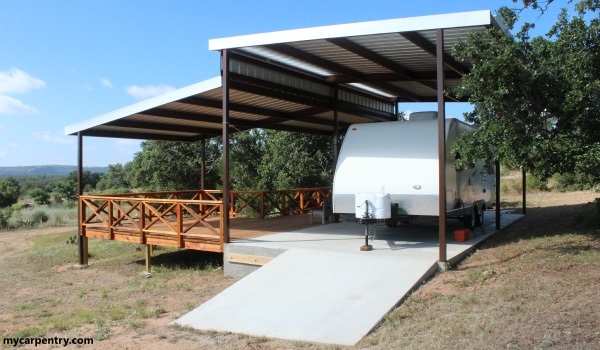 It was a great project to build and has added about 500 square feet of outdoor-room space to the existing RV-pad. We look forward to many years of fun and relaxation on our new cedar deck! I purchased all of the steel and roofing components from Metal Mart.